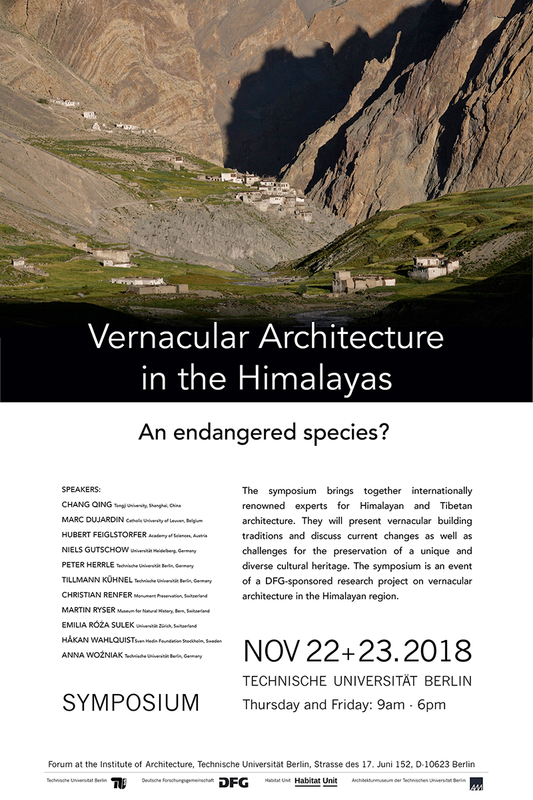 Symposium: Vernacular Architecture in the Himalayas: An endangered species? The symposium brings together internationally renowned experts for Himalayan and Tibetan architecture. They will present vernacular building traditions and discuss current changes as well as challenges for the preservation of a unique and diverse cultural heritage. The symposium is an event of a DFG-sponsored research project on vernacular architecture in the Himalayan region. It is our great pleasure to invite you to participate! 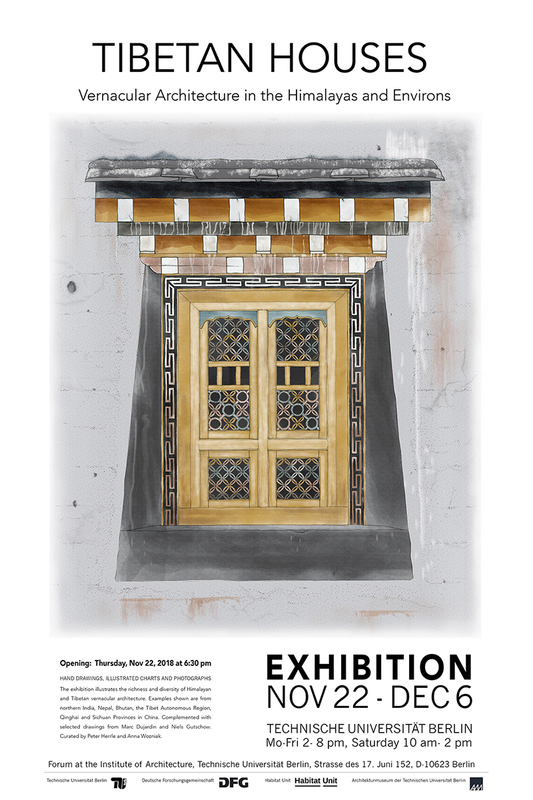 The exhibition illustrates the richness and diversity of Himalayan and Tibetan vernacular architecture. Examples shown are from northern India, Nepal, Bhutan, the Tibet Autonomous Region, Qinghai and Sichuan Provinces in China. Complemented with selected drawings from Marc Dujardin and Niels Gutschow. Curated by Peter Herrle and Anna Wozniak. 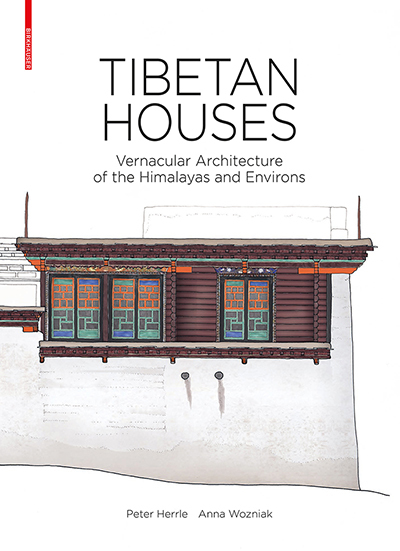 It is our pleasure to inform you about the publication of our book on Tibetan Houses: Vernacular Architecture of the Himalayas and Environs (Birkhäuser September 2017). This book presents an in depth documentation of selected examples of farmhouses across the Tibetan Plateau and the Himalayas based on a four year research project supported by the Deutsche Forschungsgemeinschaft (DFG). The book documents in detail 19 traditional houses scattered over a vast area stretching from Ladakh in the west to the culturally Tibetan parts of Sichuan in the east. They demonstrate the quality of traditional craftsmanship and architectural richness. A second part offers a comparative study of construction elements – such as walls, roofs and façades – using hand-drawn construction details and photographs. We hope this publication will be of interest to you. The Himalayan Ranges and the adjoining plains of the Tibetan Plateau have largely been imprinted by “Tibetan culture”. Ethnical Tibetans live in an area the size of Central Europe. Their cultural influence extends far beyond the Tibet Autonomous Region in China – the former religious and political center – into large parts of Chinese provinces such as Qinghai, Sichuan, Gansu, Yunnan and Xinjiang as well as neighboring countries such as India, northern Nepal and entire Bhutan. Since the heyday of the Tibetan Empire (7th – 9th century) a distinct and more or less coherent “Tibetan” culture has spread over a vast area in central Asia. It endured the change of political systems, waves of migration, wars and the influence of competing cultural values. Though fragmented into local kingdoms and numerous Buddhist sects, a stable cross-border cultural reference survived that created a unique and common identity for people living in an area stretching over more than 3,000 kilometers of the Himalayas. Part of this identity is a distinct and extremely rich architectural tradition. While originating from the Tibetan Plateau, it shows surprising diversity and flexible adaptation to local climatic conditions, economic necessities, the availability of building materials and the influence of other ethnic groups. Our Research Project, which was funded by a four-year grant from the German Research Foundation, aims to capture the richness and diversity of Tibetan vernacular farmhouse architecture by documenting selected buildings in a cross-country approach. Typical buildings in the Himalayan region were surveyed and documented. Drawings were complemented by interviews on the historical and social contexts, and an exploration of the symbolic and anthropological aspects of traditional building and craftsmanship. We envisage that the Research Project will contribute to a better understanding of what may be called a “traditional ecology of building” that is based on an intricate balance of locally available resources, energy consumption, investment and the deriving social, economic and cultural benefits. We believe that the documentation of vernacular farmhouses deserves special attention: not only do they represent the most widespread authentic cultural asset of Tibetan culture, they are also a rapidly vanishing species. In contrast to religious buildings such as monasteries and temples that have attracted a huge amount of international attention and academic research, vernacular farmhouses have been grossly neglected. A proper documentation seems urgent not only because of the architectural value of vernacular architecture but also because, with increasing modernization, even remote areas experience rapid changes in terms of accessibility, building materials, values, styles etc. In some regions the traditional farmhouse architecture is not far from becoming extinct.